It's Random Picture day here at the shoebox castle. 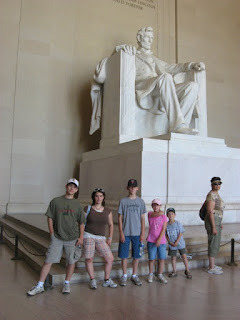 Here is a picture at the Lincoln Memorial of my kids and a strange lady who smiled and posed like she wanted to be in our picture. I bet Lincoln was sitting up there, wishing that he could go outside because it was such nice weather. This was taken during our trip to D.C. last summer--thanks again to Jen and Mike for hosting our vacation! Today will hopefully be a relatively quiet one, as far as scheduled events. Mental events, though are keeping me occupied. Katie's friend's father (kind of a neighbor--3 blocks away) died late last week and the funeral is tomorrow. Another neighbor is in the hospital. This has got me thinking about what I am grateful for and how life can change drastically without warning. I won't wax rhapsodic about this here, since I consider this more of a fun place. And I get way too philosophical when I am contemplative. Philosophy and fun don't mix. They are such completely different concepts that even though they begin with the same sound, the spelling is different! Hugs to all my friends and family. I seriously love reading your blog! I love the way you write. Oh, pshaw! Thanks! I read yours all the time too. I love keeping up on all your family news! oooh, you had to delete a comment. i've had to that a lot on my own turf, too. those pesky weirdos. thanks for posting about d.c. it was tons o' fun, and i'll kinda sorta miss it but not really.